Home office furniture includes desks and workstations, chairs, filing cabinets, storage cabinets, shelving, and desktop organizers that are designed to co-ordinate more with home furnishing styles and usages than with commercial office requirements. A wide variety of desk and workstation configurations, styles, and sizes are available. Some are mobile and compact while others are more elegant and stylish. Some include filing cabinets, shelves, and keyboard trays; others are modular and enable you to add these features as you need them. A traditional desk does the job for most administrative duties, including writing and reading mail, paying bills, and talking on the telephone, as well as planning and scheduling activities. Most traditional desks stand at a height of about 29 or 30 inches. Desks that accommodate computers must be specialized or modified for computer use. For health and safety reasons, computer keyboards should be placed at 24 to 27 inches above the floor. If you want to place a computer on a traditional desk, you can ensure that the keyboard and monitor are at the right height by installing a keyboard shelf and adjustable monitor stand. Most keyboard shelves are designed so that they can be raised, lowered, and tilted for maximum comfort. Your workstation chair is the key piece of furniture in your home office. 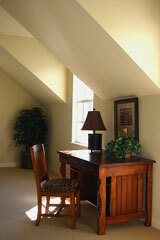 In face, your chair may be the most important piece of equipment in your home office! A well-designed chair can help make your day more comfortable and productive by reducing fatigue, back ache, and neck ache, as well as inflammation and repetitive strain injuries. Most good office chairs have adjustable features, including seat height, back angle, and arm rest positions. When looking for a chair, look for one that has a "waterfall" edge to the seat, which will prevent the seat from putting uncomfortable pressure on the backs of your thighs. Arm pads should be free of sharp or hard edges, and should be horizontally and vertically adjustable. In addition, the back of a quality home office chair is curved to accommodate the S shape of the human spine. Some chairs also tilt, adjust up and down, and provide lumbar support with the twist of a knob or press of a lever. Most home office chairs have rolling casters or wheels, which enable you to move about your office — from file cabinets to phone, to workstation — without having to constantly get up from your seat. In addition to your office chair, it's a good idea to have an upholstered chair or recliner somewhere in your office. This will allow visitors to feel at home, and will also allow you to relax and change positions should you want to read or rest. While these occasional-use chairs don't need to be ergonomically correct, they should be comfortable and inviting! A good reading lamp near your chair or recliner is absolutely necessary. Filing, shelving, and storage systems help you organize your home office efficiently, enabling you to place frequently used items close by and archival items a greater distance away, perhaps in a closet or even in a garage. Plan these systems for flexibility and growth so that you can adjust their configurations as your needs change. Remember that it's important to have "a place for everything," although it may be difficult to always have "everything in its place," as the old saying goes! File cabinets come in vertical and lateral configurations. The more common vertical file cabinets are 24 to 28 inches deep, and 15 inches wide. Vertical file cabinets are a good choice if you want your storage at the end of a desk or table. Many of these vertical files are also designed to fit underneath desks and work surfaces. Lateral file cabinets, which are designed to be placed up against walls, are generally 30 to 42 inches wide and 18 to 20 inches deep. Regardless of whether you decide to go with vertical or lateral file cabinets, both configurations come in two-drawer to five-drawer heights. It's important to choose a style and size that suits your present, but also your future, storage requirements. For additional storage needs, you will probably need some cabinets or shelving. The difference between shelves and cabinets is that you can see the items you store on shelves, while items you store in cabinets are hidden. To that end, when deciding whether to go with shelves or cabinets, consider the items you are storing and whether they are aesthetically pleasing in full view. Shelves can be wall-mounted, freestanding, or built-in. On HomeOfficeFurniture.us, we feature convenient access to several home office furniture suppliers and manufacturers who offer a broad range of home office furnishings and accessories for every budget. This office products supplier offers a wide range of affordable office furniture. Provides small and mid-range businesses with practical, professional office furnishings that deliver durability, comfort, and improved workplace performance. Offers a broad selection of office chairs, tables, desks, storage units, and accessories. Offers practical, fashionable, and affordable office furniture – from space-efficient work centers to executive collections. Creates and manufactures home and office furniture products that feature outstanding style, quality and service. Manufacturer of ready-to-assemble (RTA) furniture for the home, including entertainment, home office, bedroom, kitchen and storage. Designs, builds, and sells ergonomic computer desks and adjustable computer workstations made from solid hardwoods. 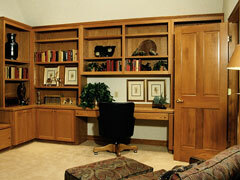 This Montana-based cabinet maker offers custom furniture and cabinetry for home offices.